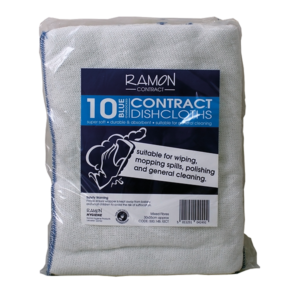 Ramon Hygiene have been manufacturing dish cloths in the UK since 1951. 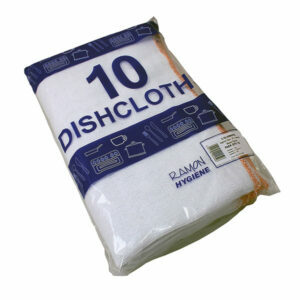 We offer an extensive range of cotton based textile cleaning cloths suitable for every cleaning requirement. 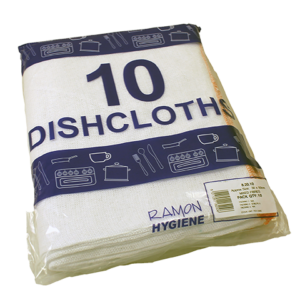 All cloths are machine washable and can be boiled or bleached to refresh and clean. Ideally all equipment used within different areas of a venue should be suitably colour coded. 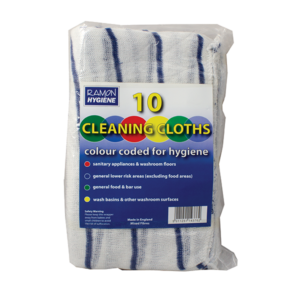 Consequently these cleaning cloths are the perfect choice for companies who operate colour coded cleaning regimes.They are available in the 4 hygiene colours to clearly identify their area of use.The cloth offers good absorbency and suitable for use on any surface.Machine washable and manufactured in the UK you can be assured of a consistent and quality product. Premium white stockinette dishcloth, manufactured for cleaning professionals. 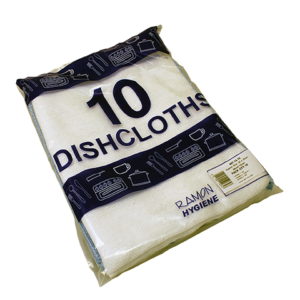 Excellent quality, cotton based textile cleaning cloth which is suitable for every cleaning requirement and is also available in large as well as extra large sizes.All cloths are machine washable, boiled or bleached to refresh and clean. 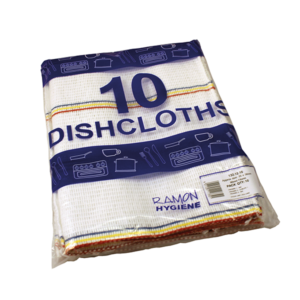 Cloths are supplied in printed Ramon packaging as standard, or can be supplied in plain bags, bulk or in private packaging, dependent on quantities. 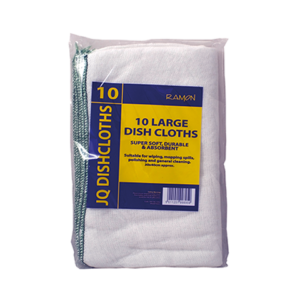 Ideal for all general cleaning tasks with its premium quality is the XL White stockinette dishcloth. Carrying a super absorbency and can also withstand the heavy duty cleaning tasks. May be machine washed or boiled as well as bleached to refresh as necessary. Traditional stockinette dishcloth which is perfect for washing dishes and general cleaning tasks. 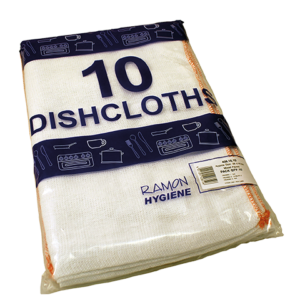 Manufactured in the UK at our factory based in Leicester this cotton based textile cleaning cloth is suitable for every cleaning requirement and is available in a variety of sizes.All cloths are machine washable and can be boiled or bleached to refresh and clean. 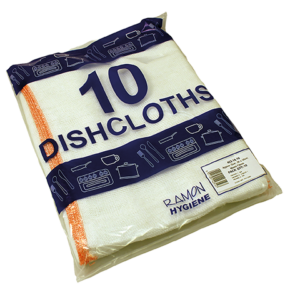 Cloths are supplied in printed Ramon packaging as standard, or can be supplied in plain bags, bulk or in private packaging, dependent on quantities. Heavy duty to withstand the tough cleaning tasks. Super interlock dishcloths can be machine washed, boiled as well as bleached to refresh as necessary. Traditional stockinette dishcloth which is perfect for washing dishes and general cleaning tasks. Manufactured in England at the our Leicestershire based factory, this cotton based textile cleaning cloth is suitable for every cleaning requirement and is available in a variety of sizes.All cloths are machine washable and can be boiled or bleached to refresh and clean. 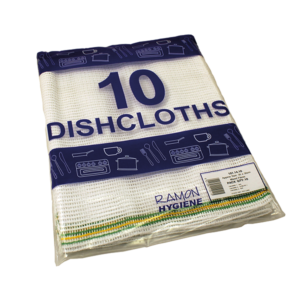 Cloths are supplied in printed Ramon packaging as standard, or can be supplied in plain bags, bulk or in private packaging, dependent on quantities.